For some reason, I wasn't very excited to see Disney's latest motion-picture release, Tomorrowland, starring George Clooney and Britt Robertson. Although I found the premise intriguing, the idea that the most brilliant minds of today could come together in a futuristic dimension to help save the world, I wasn't convinced that Disney's execution of it would deliver. So what is my final verdict? Does Tomorrowland live up to all the hype? Drum roll please.........well, sort of. On one hand, the film's story was filled with holes and moments that could have, and should have, just been edited out. Moments that were so over-the-top, I rolled my eyes. However, as far as it being Disney's attempt at waking up humanity to save our planet, I would say it is definitely worth seeing. And, visually, this film was a thrill on the big screen. We are taken back to the 1964 World's Fair in New York - a time when the prospects of the future were exciting and limitless. Fast-forward to 2015 where humanity finds itself looking down the barrel of a gun in regards to the future of our planet. Where everywhere we turn, we are reminded of the unavoidable dystopia humanity is headed toward. 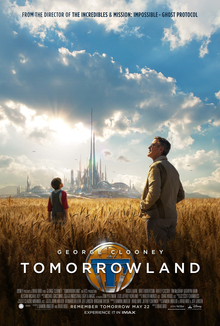 But, Tomorrowland asks its viewers - can we fix the future or has the human race given up? In essence have we given in to the self-fulfilling prophecy that the end of the world is imminent? Are there any dreamers still out there that are willing to fight for our existence? Disney's Tomorrowland reminds us that inspiration can absolutely make the world a better place. Dreamers and thinkers that stick together can save the world. WE make our own destiny. But, we must stop feeding the wrong wolf. The end of the film is a not so subtle challenge to today's youth to stand up and fight for our planet. A challenge I hope younger generations take. There were plenty of moviegoers in attendance sans children indicating Tomorrowland is a safe bet for all fans of high-action, fantasy/sci-fi films. Even though I wasn't overly impressed with the film as a whole, the message is an important one and I liked it more than I was expecting. Parents may need to discuss the film with their children afterwards. I asked my 10-year-old what he got out of the movie (he loved it, by the way) and he said to never give up on your dreams (bingo!) and that humans are really messing up the planet (double bingo!). However, I had to steer him toward the biggest message which was that it's not too late to FIX the future. PARENTS: Tomorrowland is rated PG for sequences of sci-fi action violence and peril (lots of robots that look like humans getting decapitated, no blood, and intense explosives), thematic elements (the message is sophisticated and can be difficult to follow for younger viewers), and MILD language. Yes, the view of the future was very different in 1964 than it is now. Thanks for reading and commenting. I did hear on the radio today the movie didn't pull in as much as they expected. I think there was a lot of hype honestly. I would like to see it still but I may wait for it to come out on video. I am glad I get to read your reviews I learn a lot before I now go out. The Native story you have is awesome. My Aunt told me this while I was going through my divorce. The long version is of a Chief telling a young boy this. I used this in my blog in many places and think it is just so true.. 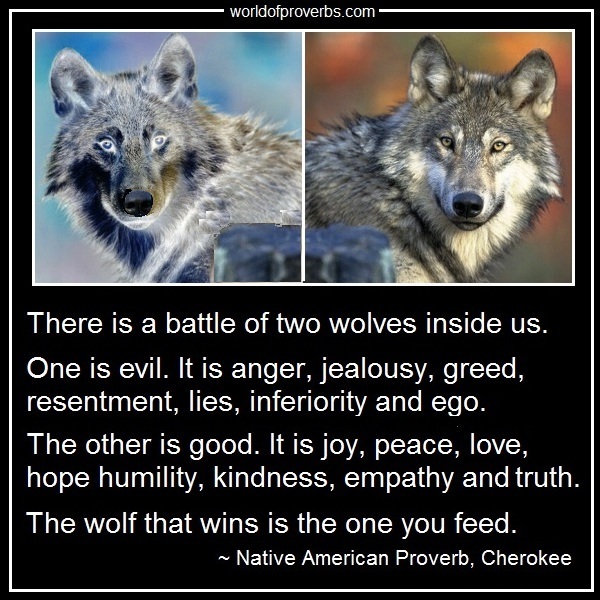 Yes, the story of two wolves is one of my favorite Native American proverbs and is used in the movie. Glad my reviews help. Thanks for reading and commenting.